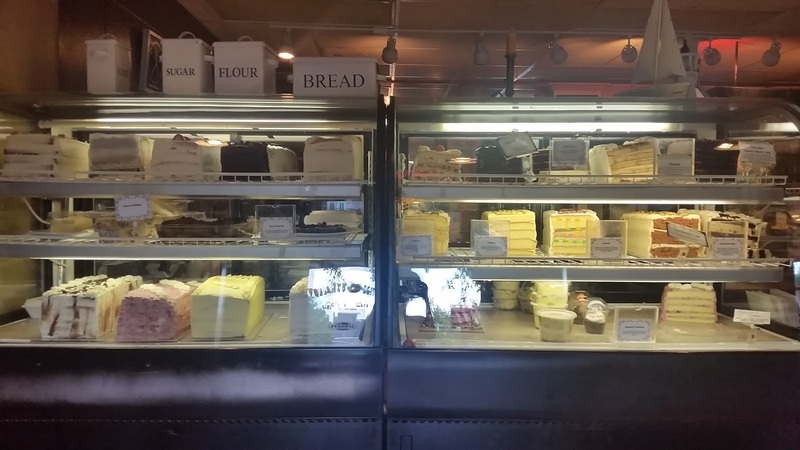 This edition of Excited about Eating takes us to Nantucket Grill, located at the corner of Hwy 54 & Farrington Rd in Chapel Hill, North Carolina. With its friendly casual environment, Nantucket Grill caters to couples, families and UNC fans with a wide variety of menu options. We visited on Saturday night for their much anticipated free cake night, a free slice of mile high goodness with each entree over $13. Dora here. Confession time. We come up with excuses to make the two hour drive here on a Saturday just for the cake. Feast your eyes on this dessert case. Wouldn’t you? Cake case. Bam! Right as you enter. 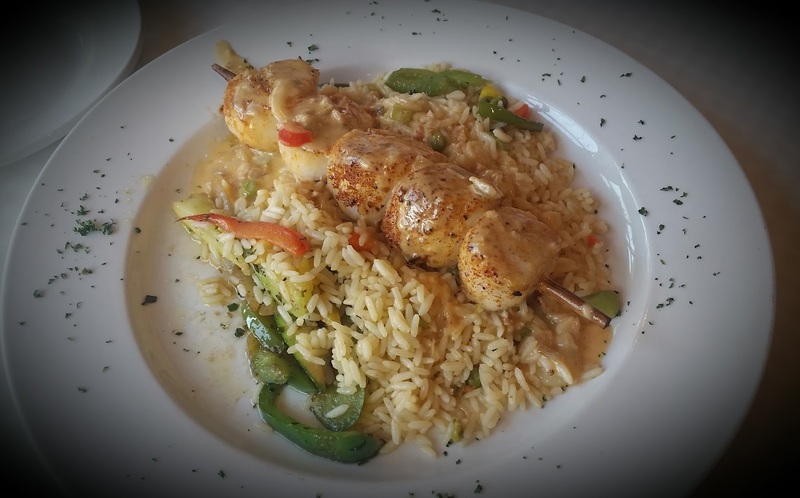 Since I judged BBQ that day, my wife and I shared the full portion of the Grilled Scallop Kabobs (2 skewers), served over herb rice and mixed vegetables and drizzled with lobster cream sauce. We were surprised when the meal came out already divided on two plates. Dora here. Yeah, this plate is only half the meal! Yowza! Generous scallops perfectly cooked, golden on the outside, tender and meaty on the inside. The rice, peppers and onions complemented the dish, but the main star was the lobster cream sauce. Creamy, with only a hint of seafood, a sauce that would raise any seafood to the next level. Outstanding! Dora here. Oh. My! Smooth. Luxurious. Every bite leads to one more. I practically licked my plate clean! 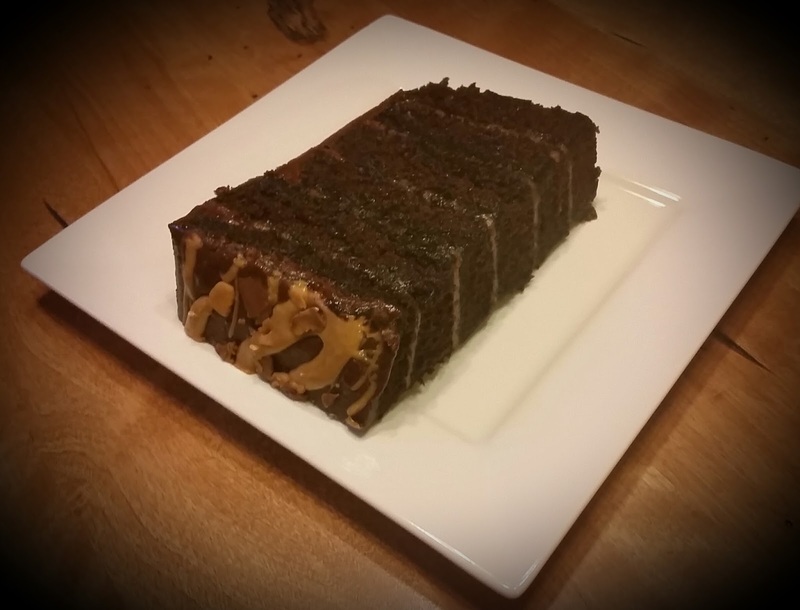 And then…the Chocolate Peanut Butter cake. Six layers of chocolate cake separated by peanut butter filling and topped with chocolate butter cream icing, a Reese cup and peanut butter drizzle. Normally, I am not a big chocolate cake lover, but this cake was great with the peanut butter taking a back seat to the chocolate. 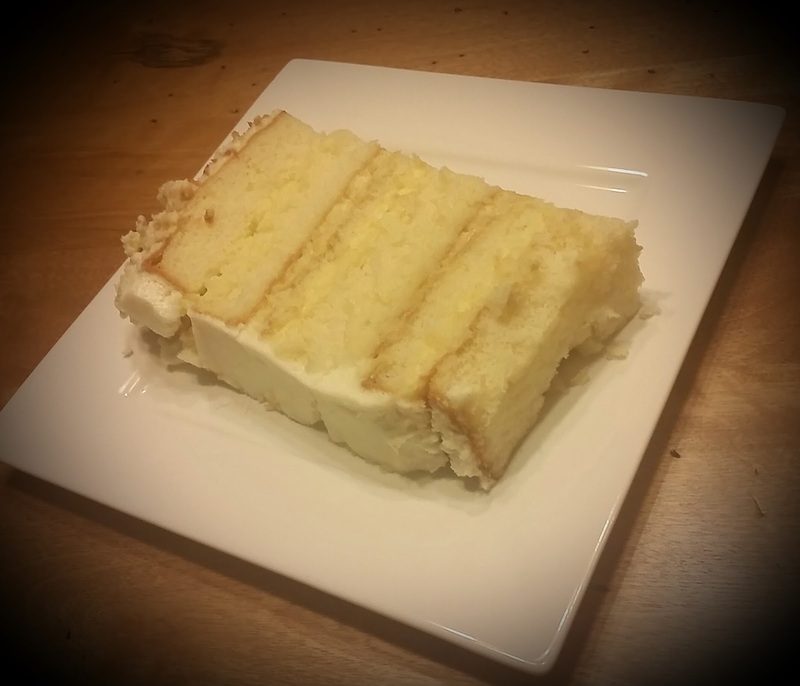 So rich, it was difficult to eat the entire slice in one seating. Dora here. Speak for yourself, Ernie. I had no problem eating mine!